Walk through one of the most awe-inspiring landscapes found anywhere in the world – just 90 minutes from Sydney. Explore waterfalls, canyons, subtropical forest and views that make this place so renowned, whilst staying in luxury accommodation perched at the very edge of it all. With one million hectares of bushland, this pristine wilderness has more trails than you can shake a walking stick at. And we’ve chosen only the very best of the Blue Mountains walks. Take in panoramic views that stretch out to the horizon, get up close to the Three Sisters and witness breathtaking landscapes of the famed Blue Mountains blanketed in the distinctive blue haze for which they were named. This is Blue Mountains hiking at its’ very best. Unparalleled natural beauty meets sophisticated living, with à la carte meals provided as part of the service at Echoes Restaurant & Bar. This ultimate dining experience places you in a relaxed setting atop a balcony that overlooks the Jamison Valley, surrounding you with nature. 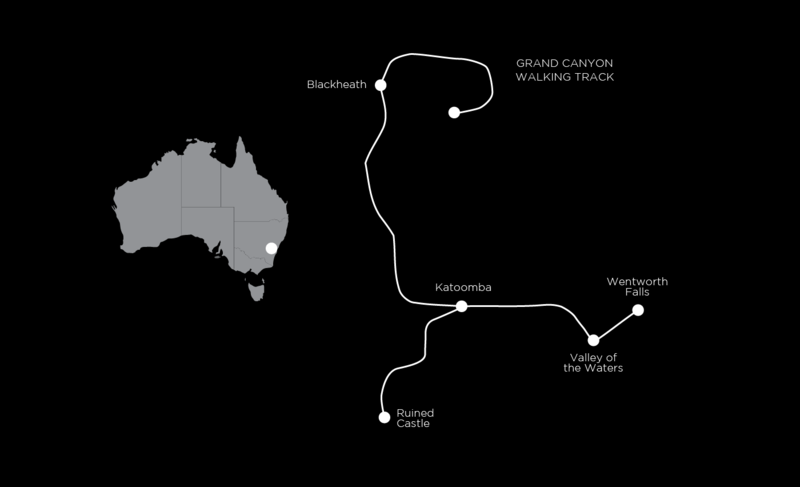 We will meet you in the city to begin your journey to the World Heritage Blue Mountains National Park. We’ll start the Blue Mountains walks by hiking through rainforest and open woodland, opening up to spectacular overlooks, then trace creeks beneath ferny understory down into the forest. Work your way through the valley and up to a lookout point for views of Grose River Valley. Then watch for colourful king parrots taking flight and for the “weela weela” song of the yellow-tailed black-cockatoo. We continue with the very best of Blue Mountains hiking with a descent through the bush to spectacular Bridal Veil Falls, which plummets over 100 metres. Leading uphill, we’ll trace the valley edge to Evans Lookout, where you can admire the Blue Gum forest 500 metres below. Navigating down steep terrain to the Grand Canyon Creek we’ll pass silver-bark ash trees and black wattles following undulating terrain of tall coachwoods, sassafras, and giant ferns. Once at the Grand Canyon, take in the beautiful and impressive gorge, cut and shaped by the river below over millennia. Pass through The Rotunda, an expanse of sand and silt overshadowed by hanging rocks. The morning will begin with a walk from our accommodation to the Skyway East Station. From here, catch the Scenic World Skyway over to the Scenic World Top Station. From there you will have a choice to either take the Scenic Railway (the steepest incline railway in the world) or Scenic Cableway (the steepest aerial cable car in the Southern Hemisphere) down to the valley floor to begin the walk. Either of these options will take you on an exhilarating ride into the depths of the Jamison Valley rainforest, passing relics left by coal miners over 100 years ago. Look for the elusive ground-dwelling lyrebird and sip crystal clear water from Marrangaroo Spring. Enjoy a lunch among a flock of cheeky currawongs or rosella parrots after scrambling up past apple, peppermint, and bloodwood trees to the impressive rocky outcrop known as Ruined Castle. Upon return, you’ll have the option of boarding the cableway or railway, or opt to climb the Furber Steps, providing a rewarding ascent through dense rainforest, past cascading waterfalls and lovely grottoes with valley views mixed between. The setting for the grand finale is Wentworth Falls, the Jamison Valley and the Valley of the Waters. This historic route and one of the most iconic of all the Blue Mountain walks, winds its way alongside waterfalls, beneath overhanging cliffs and through magnificent grottoes. The first section of the walk is concentrated on Wentworth Falls. At the bottom of the falls we’ll stop and admire the view, experience the refreshing mist and sip morning tea. Expect to eat lunch at the Valley of the Waters. The real highlight is the ‘midcliff’ walk along a wide path that has been carved into the sheer cliff face. Handrails, ladders and airy lookouts provide a birds-eye view over countless hectares of forest. Take a short walk back to the top of the cliff where it is back on the bus with an expected ETA to Sydney at around 4:30pm. The Blue Mountains hiking tracks are well graded and easy to negotiate. Full day walks average about 14 to 15km with some ups and downs. Echoes Boutique Hotel & Restaurant is a 4.5 star 12 room boutique hotel located right on the cliff’s edge in Katoomba and complements the outstanding Blue Mountains walks. The views from the rooms and the balcony restaurant are truly spectacular. Located next to Lilianfels Resort & Spa, walkers can enjoy full usage of facilities including both indoor and outdoor pools. Echoes is renowned for its innovative cuisine and fine wines, with the Blue Mountains being one of Australia’s most famous foodie destinations. Echoes Boutique Hotel & Restaurant offers our walkers a unique, unforgettable gastronomic experience that showcases the region’s fresh local produce. Each day begins with a buffet cooked breakfast, followed by a healthy lunch that includes a wrap, fruit and slice of cake. There’s no set menu, the 2 course à la carte dinners are prepared by professional chefs and are a highlight as they’re accompanied by views over the valley from the restaurant. The Blue Mountains walks are 45% easy, 35% moderate, 20% more challenging. 10-17.5km (3 – 6.5 hours) walking each day on mostly well-formed and well graded walking tracks. This trip operates with experienced and knowledgeable guides so we can offer easier and more challenging walk options along the way. Please note, with groups of 7 or under we will run this trip with just one guide. Pre and post tour accommodation: There are many good hotels in Sydney, however we pick up and drop off from one central hotel the Pullman Circular Quay. The tour starts at 8:30am at the Pullman Hotel Circular Quay, 61 Macquarie Street and finishes on day 3 at 4.30pm in Sydney. October-November is usually mild to warm. Temperatures warm up from December-February. March-April is usually cool to mild. Temperatures drop from May onwards and the days are cool to cold. July brings occasional snowfalls. Warmer, spring weather returns around September.